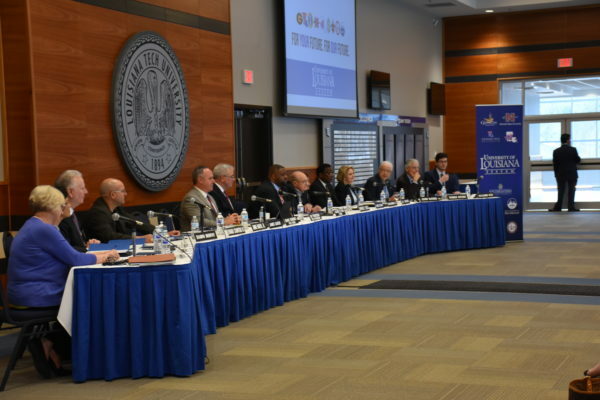 The Board of Supervisors for the University of Louisiana System held its regular board meeting in Ruston at Louisiana Tech University. The Universities of Louisiana will host its annual ULS Day at the Capitol April 11. A swarm of students, faculty, staff and alumni will visit the capitol to promote the System and support from our state’s leaders. McNeese State University: approval of a Post Baccalaureate Certificate in Strategic Corporate Communication. University of Louisiana at Lafayette: approval of a PhD in Earth and Energy Sciences. University of Louisiana at Monroe: approval of a Letter of Intent to develop a New Academic Program leading to a Master of Music Education. University of New Orleans: approval of a Letter of Intent to develop a New Academic Program leading to a Master of Science in Cyber Security and Operations. University of New Orleans: approval to award a Doctorate Honoris Causa to Mr. Paul David Hinnenkamp at the Spring Commencement Exercises. Northwestern State University: approval of an amendment to a contract with Sean Kiracofe, Head Women’s Volleyball Coach, effective March 1, 2018. Northwestern State University: approval of a contract with Mr. Brad Laird, Head Football Coach, effective November 20, 2017. Northwestern State University: approval of a contract with Ms. Anna Jobe, Co-Head Women’s Soccer Coach, effective January 8, 2018. Northwestern State University: approval of a contract with Mr. Jess Jobe, Co-Head Women’s Soccer Coach, effective January 8, 2018. Southeastern Louisiana University: approval of a contract with Mr. Frank Scelfo, Head Football Coach, effective January 30, 2018. University of Louisiana at Lafayette: approval of a contract with Mr. Gerald Glasco, Jr., Head Softball Coach, effective December 1, 2017. University of Louisiana at Lafayette: authorize the University President to sign and execute an assignment of ULL’s Assistant Football Coach Karl Scott’s employment agreement to the Board of Trustees for the University of Alabama (UA) in exchange for $300,000. University of Louisiana at Monroe: approval of a contract with Mr. Mike Collins, Defensive Coordinator/Assistant Head Football Coach, effective January 1, 2018. University of Louisiana at Monroe: approval of a contract with Mr. Matt Kubik, Offensive Coordinator/Assistant Football Coach, effective January 1, 2018. University of Louisiana at Monroe: approval of a contract with Mr. Grayson Crawford, Assistant Men’s Baseball Coach, effective January 8, 2018. University of Louisiana at Monroe: approval of contractual amendments with Mr. Matt Viator, Head Men’s Football Coach, effective January 1, 2018. Nicholls State University: approval of a contract with Mr. Tim Rebowe, Head Football Coach, effective January 25, 2018. McNeese State University: approval to enter into a Ground Lease Agreement with the McNeese State University Foundation to replace the artificial turf football field at Cowboy Stadium. Nicholls State University: approval to lease 6,350 square feet of office space at the Theodore Duhé Building located in Houma, Louisiana, to the START Corporation. University of Louisiana at Monroe: approval to lease 3,003 square feet of University campus health clinic space located at 1140 University Avenue (Rooms 101-127) in Monroe, Louisiana to Affinity Health Group, LLC. Nicholls State University: approval to conduct a student referendum to approve a self-assessed Student Media Fee. University of Louisiana at Lafayette: approval to expand the eligible partners and targeted student groups who receive a tuition deduction for the contract price of the RN to BSN online degree program. 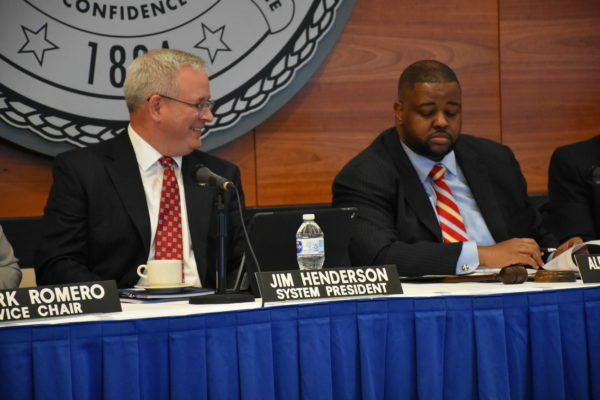 University of New Orleans: approval to (a) adjust fees for qualified students from the Gulf States of Alabama, Florida, Mississippi, and Texas; and (b) adjust pricing for all summer session students. University of Louisiana System: approval of payments made by nonprofit organizations to employees of the University of Louisiana System during Fiscal Year 2017 in accordance with provision of Louisiana Revised Statute (R.S.) 17:3390(F). University of Louisiana System: discussion of Fiscal Year 2017-18 second quarter financial reports and ongoing assurances. University of Louisiana System: financial status of alternatively financed projects for the six months ended December 31, 2017. Grambling State University: approval to appoint Dr. Carolyn Hester as Dean of the College of Professional Studies effective March 1, 2018. Grambling State University: approval to appoint Dr. Andolyn Harrison as Dean of the College of Educational and Graduate Studies effective March 1, 2018. Nicholls State University: approval to appoint Mr. Alex Arceneaux as Executive Vice President effective January 1, 2018. Nicholls State University: approval to appoint Dr. Michele Caruso as Dean of Students effective January 22, 2018. University of Louisiana at Lafayette: approval to appoint Dr. Melinda Granger Oberleitner as Interim Dean of the College of Nursing and Allied Health Professions effective January 1, 2018. University of New Orleans: approval to appoint Dr. Norma Jean Mattei as Interim Dean of the College of Engineering effective January 16, 2018.